We're located above the Scotiabank, across the street from the football field at Wagner High School. The clubhouse is open evenings from 6:00 pm to 8:30 pm during practices. Most weeks June through October that's Tuesday, Wednesday & Thursday. If you can't make it you can reach us by email or leave a voice message. The Edmonton Chargers Football club is a place for boys and girls ages 8 and up to come and play full-contact competitive football. They will learn the discipline, team work and good sportsmanship which the Chargers are known for wherever they go, along with many other life lessons. The Chargers is run completely by volunteers and has no paid staff, coaches or administrators. With the help of parents and volunteers the Chargers organization is able to provide the best and safest equipment to the players as well as a full clubhouse for players to come and enjoy. The Chargers is one of the most afforable teams that you can put your child on. One low price includes a full season, high quality equpiment, insurance, team and individual photos as well as transportation to and from games. For more information see our individual team pages. The Chargers Football Club is the oldest minor football program in the City of Edmonton. The Chargers Bantam Football team was created in 1972 as the Donnan Knights with Larry Kaban as head coach. The Club played in the Huskies Athletic Association League along with 26 other bantam teams. Under his direction the club grew and was eventually taken over by one of his former players, Dale Manko, who along with many other great volunteers brought the team to its current standing as one of the City’s finest football clubs. In 1974, the team underwent a name change to the Oil Patch Oilers and the team colours became gold and black. The team then became the Union Tractor Crawlers. Finally, in 1985, the team made the most recent transformation to the Chargers Football Club. The Chargers currently have 4 teams; one each at Atom, Peewee, Bantam and Midget, all of which participate in the Capital District Minor Football Association. The Club has operated out of a number of locations; the back of a pick-up truck, a converted rink shack, tennis court change rooms and in 2000 we moved to 6025 - 86 Street across from the fields at W.P. Wagner High School. The majority of assistant coaches over the years have been former players who came back to share their experiences and knowledge. In addition to the Midget, Bantam, Peewee and Atom teams winning many Capital District Minor Football Association Championships at Tier I and Tier II, we have also won several Football Alberta Provincial Championships. We are very proud of the fact that the Bantam team has been recognized by the Edmonton Football Official’s Association as the most sportsmanlike team for 14 out of 20 years while the Peewee team has received this award 5 out of 10 years. We have been major supporters of the Alberta Summer Games and the Football Alberta Bantam Bowl since their inception. The club has a proud heritage and strives each year to maintain high quality coaching and to continually field teams that stand out as good sportsmen and athletes. It is a goal of this organization to give the players an experience they will remember and will teach them life skills through football. Football Alberta's tribute is posted below. In a volunteer role stretching close to 30 years, Susan Morgan’s accomplishments are truly too numerous to mention. 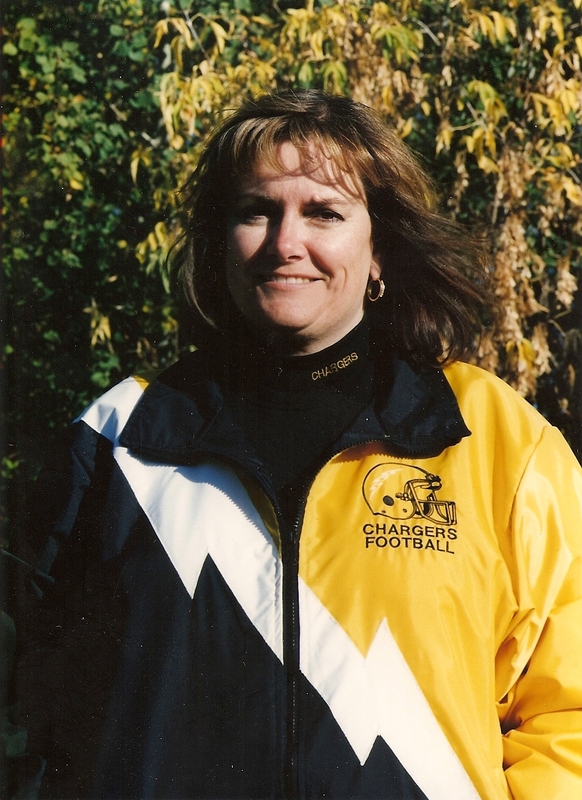 Started with Edmonton Chargers in 1989 as a General Manager, Susan not only stabilized their program but helped other teams stay afloat in a dark time for minor football. Eventually volunteering with the CDMFA and holding several positions, Susan was the main driving force behind its expansion from 7 bantam teams to over 60 teams and five different levels of play. As a Football Alberta DR, she was instrumental in the start-up of Minor Provincials, Bantam Bowl, Team Alberta U16 and footballs involvement in the Alberta Summer Games. Susan passed away in June of 2016 and will be dearly missed by all involved in the Minor Football world both locally and Provincially and is one of the most deserving additions to the Life Membership/ Hall of Fame Award we’ve ever had. We have pictures of the Edmonton Chargers teams going back to 1972 hanging on the walls of our clubhouse. If you played for the Chargers, or know someone who did, consider this an invitation to come to the clubhouse and take a walk down memory lane by trying to pick them out of the crowd. We're missing pictures from 1974 & 1980. If you have a copy that you're willing to donate to the club or let us reproduce you would earn our sincere gratitude. The Edmonton Public and Edmonton Catholic School Boards recognize the most valuable player at the high school level with the Grant Yuzyk Award for Junior Players and the Haliburton Award for Senior Players. Since 1990, Football Alberta annually selects 40 players from Northern Alberta and 40 players from Southern Alberta for two All Star High School Football Teams. These two teams play one annual game called the North South Game on the May long weekend. Following this game the top 40 players from both teams are then selected for Team Alberta, the provincial All Star team that represents Alberta in the Football Canada Cup in July.